It’s a big job preparing your home for the holidays, but there are businesses in our region that help to make the season bright — and do so easily. We caught up with a few to learn what it takes to make a great holiday home. The team at Arvidson Pools & Spas, with locations in Crystal Lake, St. Charles and Palatine, perform setup and tear-down on exterior holiday decorations. Preparing your home for the holiday season, both inside and out, can be a taxing undertaking. Some of us lack the time. Others lack the creative vision to put together that perfect look. But don’t fret. There is help, if you know where to look. 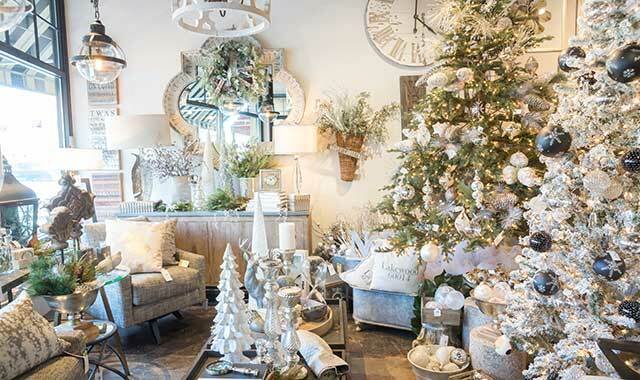 In Crystal Lake, in particular, you’ll find three businesses that can transform your home into a winter wonderland. When you think pools and spas, it conjures up many images. And most of them involve a sunny summer day. Certainly not visions of Christmas. But about nine years ago, that’s the direction Arvidson Pools & Spas headed. The firm has locations in Crystal Lake, St. Charles and Palatine. 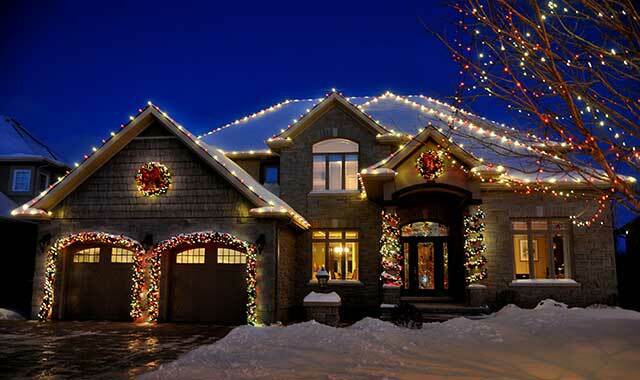 Arvidson is now a popular destination for people looking for custom holiday decorating of the exterior of their homes. Arvidson boasts a sales staff that is trained in various design concepts, ranging from lighting to freestanding decorations. “The company that we buy the lights and other equipment from also helps us with not only understanding elements of design, but the software that helps us computerize the whole process,” Marunde says. “People can talk with our sales team about what they are looking for, and we can help make it a reality. “They might just want a wreath or a decorated bush, but frequently our salespeople can suggest other ideas. More often than not, people love the designs we suggest,” he adds. Marunde says roof and ridge lighting are always a big part of the layout. Window decorating, tree and bush enhancements, and stake lights lining sidewalks and driveways add further enhancements. “And we have daytime decor and greenery, like garlands and wreaths,” Marunde adds. Freestanding items like toy soldiers and reindeer are more permanent and durable than the popular blow-up models. The Arvidson’s team doesn’t stop with the set-up. Marunde believes that sort of full service is what keeps people coming back. The cost for exterior holiday decorating varies, depending on the size of the job. Marunde estimates the average is around $1,500 per season for residential designs, though smaller jobs are possible. No matter the level of work, Marunde vouches not only for its quality but also its timeliness. One reason the team can act quickly is because repeat customers receive setups as early in the season as possible. The team at Countryside Flower Shop, Nursery & Garden Center, in Crystal Lake, sells a wide variety of Christmas decor, including wreaths, garlands and whiskey barrel home accents, but crews can also help to decorate a home or tree and then clean it all up when the season is over. When you’ve been doing holiday decorating for more than 20 years, you become pretty good and efficient. It’s all part of the convenience that Countryside offers when it comes to helping people prepare for the holidays. The store at 5301 E. Terra Cotta Ave. offers both interior and exterior decorating services. Countryside offers both residential and commercial services, although Braglia admits she prefers the intimacy and variety that come with helping people spruce up their homes. The best example comes when Braglia and her staff decorate trees. Countryside offers pre-decorated trees for purchase, but in most cases people have their own tree and choose what they want it to look like. Braglia has done as many as five trees in one home, along with bannisters and wreaths. And along with the traditional types of decorations, Countryside also offers new, unique products, including a line of items made from whiskey barrels turned into things like lazy susans and serving trays. And for the guys seeking a more masculine look to their holiday decor, there are products from Torched that include magnetic beer bottle openers, candles, hot sauces and shot glasses made out of beer tops. Not only does Countryside set up your holiday look, they also take it down. “We pack it back up and put it in our storage bins at your place, so it’s ready for next year,” Braglia says. Once you have your initial decorations you pay only for the labor. The cost depends on the size of the job. It’s $60 per person per hour, and Braglia usually works with two assistants, making it $180 per hour. The time for a project also is based on the size. Braglia currently has close to 50 regular clients, but she still has room for more. 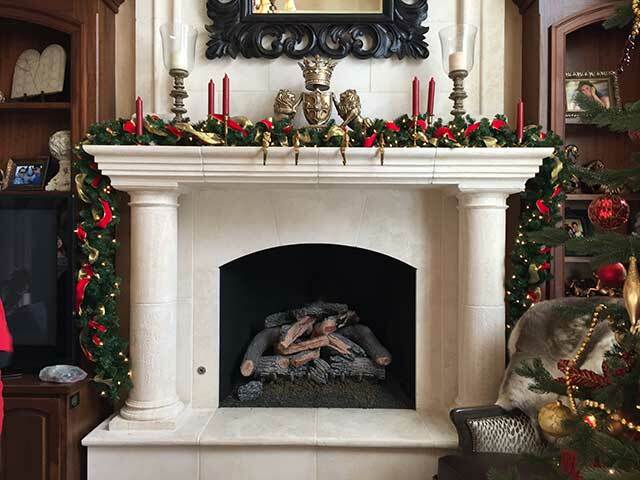 Yours & Meyn, in downtown Crystal Lake, uses lavishly decorated motifs, such as living rooms and fireplace mantels, to help shoppers visualize how home accents might fit into their own dwellings. Professional designers on-site are also available to customize home decor or create the right assembly of accents to set the holiday mood. For the do-it-yourself holiday decorator, knowing where to start is sometimes the most daunting challenge. Mary Meyn, owner of Yours & Meyn, Simply Designed, in downtown Crystal Lake, believes coming home for the holidays is about bringing family together. So, she and her team offer their own design expertise to help customers make the most of their holiday decorating. Come the first weekend in November, the store is transformed into a winter wonderland with numerous vignettes incorporating colorful holiday accents. Yours & Meyn is both a retail store and an interior design studio. During the holiday season people frequent the store just to see what new adornments are on the sales floor. Among its many home accents, Yours & Meyn carries a variety of holiday items including ornaments, garland and ribbons. But items for purchase are just a part of what Yours & Meyn has to offer. The store also enables customers to build upon things in the store or else enhance what they already own. The professional staff offers creative ideas to the most interesting requests. The key to the whole experience is the staff, which includes four designers and several home stylists who can tackle anything from a simple tabletop arrangement to a full room design. Customers and clients may also ask the Yours & Meyn team to visit their homes for professional advice. It’s one more way the store can stand apart from impersonal online options. For those special projects that require a designer’s input, appointments are encouraged, but Meyn says walk-ins are always welcome. This entry was posted on Wednesday, November 21st, 2018 at 12:00 pm	and is filed under Home & Garden, Top Posts. You can follow any responses to this entry through the RSS 2.0 feed. Both comments and pings are currently closed.